The Association of Chess Professionals continues the tradition of appreciating and awarding the best chess organizers from around the world. This year we are anticipating our poll to make it even more relevant. To determine the best event, we invite you all to pick your most-liked events from each of the following categories – Round Robin, Open, Official and Rapid/Blitz. 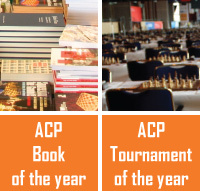 Each member is asked to vote for a maximum of 3 tournaments in each of the categories of tournaments below, and up to 5 in the Overall Best, which will determine the ACP Tournament of the Year 2017.